A possible heart attack call brings back memories for Johnny. This is a response to a Powwow story request from a friend on the iluvgage ning site. "This is for you Rose"
It was a cool morning in late April. The men of the A-shift at Fire Station 51 in Carson, California sat gathered around the kitchen table drinking coffee while waiting for roll call. Well…almost all of the men. The youngest crew member had yet to arrive, which was nothing unusual. He normally ran in at the last minute in a rush to change into his uniform. Today would be no different. "Has John made it yet?" Captain Stanley asked as he crossed the dayroom in search of more coffee. "Come on Cap, you don't really think he'd be here "before" roll call started do you?" Chet commented from behind the sports page of the morning newspaper. "What do you mean "before" roll call Kelly? I'm always here "before" roll call." Johnny commented from the doorway where he stood with his hands on his hips. "Yeah…because Cap waits for you to be on the premises "before" he calls it, Gage." Chet folded the paper and leaned back in his chair with a smirk. "Roll call in 5," Cap announced before lifting his cup to take a sip. Roy, Marco and Mike hid their smiles behind their own cups. Chet raised one hand toward Cap in a show of confirmation. Johnny spun on one foot and disappeared in a mad dash for the locker room to change. A few seconds later he could be heard yelling Chet's name. "Kelly, do you think you could give him a break now and again?" Cap smiled and nodded his head. "Just once in a while it might be nice for him to start a shift without wet hair." He left the room to get his clipboard and meet the men in front of the engine. Chairs could be heard sliding across the floor as the others followed him into the bay. Johnny slid into place at the end of the line with hair dripping. He fumbled with his badge trying to get it fastened. Roy lost patience in watching Johnny's unsuccessful attempt at getting the clasp closed and batted Johnny's hand away. He quickly had the badge in place. Johnny nodded his thanks to his partner and turned to the front just in time to see Cap waiting beside him. "Nice of you to join us, John." "Y…Yes sir." Johnny stared straight ahead at attention. "Relax son," Captain Stanley moved to the center of the line and faced his men. "We have a lot to cover this morning. I have several memos from headquarters, so we'll do roll call here and then move to the table to go over the rest." After finishing the memos and going over a few inspection location details the men were dismissed to begin the morning routines of checking the engine and squad. "I'll be right back." Johnny said as he turned toward the locker room; returning a few minutes later with his jacket on. He looked up and noticed Roy looking at him with one eyebrow raised. "What?" "Are you feeling alright this morning?" Roy leaned back against the squad waiting for Johnny's answer. "What do you mean by that? Can't a guy put on his jacket when he's cold?" "Well…it's a little chilly outside, but it's fine in here." Roy said slowly, calmly watching his partner fidget under his scrutiny. "W-e-ll, YOU didn't get soaked…AGAIN…with a water bomb this morning, and I don't like being cold. Okay?" Johnny squatted beside the drug box and started counting effectively closing the conversation. Roy chuckled and shrugged off the thoughts of Johnny possibly getting sick again. Johnny swallowed again trying to relieve the scratchiness in his throat. Truthfully, he did feel as though he might be getting another cold. It seemed as though he was always fighting a cold since he had to have his spleen removed after getting hit by that drunk driver. Chet's water bombs didn't seem to be helping. "We need some supplies." "Okay we'll run by Rampart. I'll let Cap know." Roy returned the bio-phone to the compartment on the side of the squad. Johnny stood and slid the drug box into place and closed the doors; then he moved to wait by the passenger side door to see if Cap agreed to their supply run. A few minutes later they were in route to Rampart when the tones squawked from the radio. "Squad 51 possible heart attack…UCLA North Athletic Field…Sunset Blvd and Westwood Plaza." Johnny looked over at Roy as he reached for the mike. "That's 36's area. I wonder why they called us." "They must be on a run already." Roy looked over his shoulder to be sure there was no traffic before making a U-turn to head in the opposite direction while Johnny confirmed their response to dispatch. It took a bit longer than either paramedic liked to get to their destination, but before long they were entering the long road that lead through the vast parking lot and up to the Athletic Field. The windows were still up on the squad. With the air cool and Johnny still in his jacket the vents provided enough air to keep the cab from overheating. But the closer they got to the field the more they could discern a constant beat. Johnny's mouth opened and his eyes widened a bit. He leaned over and slowly rolled down the window so he could hear better. "I thought you were cold." Roy commented. Johnny raised his hand in a shushing manner. "What's wrong?" "Hear what?...the drums? Yeah I can hear them. So?" He turned and proceeded through the gate the guard opened for them to gain access to the field. "Shhhh." Johnny was leaning half way out the window now trying to see past the bleachers; listening to the unmistakable sounds of drums repeating a sequence of hard beats followed by several softer ones. A voice through a loud speaker welcomed everyone to the annual Powwow and announced the upcoming events. Roy's mouth spread into an irritated frown, but he stayed silent. "Roy, do you know what this is?" "A possible heart attack." He dead panned. Johnny shot him an irritated glare. "I know that…I mean all these people. Do you know what they're here for?" For a second Johnny listened to the sounds of memorable songs…not the words though…chanting seemed to have taken the place of the familiar words. The squad drove past booths that lined the perimeter of the festivities that had brilliantly colored blankets with intricate patterns hanging from the poles that held the tents aloft. The blankets were slowly moving back and forth, blowing in the breeze. 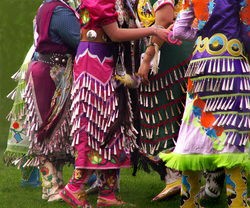 People milled about wearing buckskinned pants and dresses decorated with feathers and beads. Young and old…some with canes…some dressed in all their regalia pushed in wheel chairs. It gave Roy a sense that this was a treasured tradition that stretched across many generations. He felt a sense of the pride these people had for their heritage. It was contagious. "Looks like some kind of Native American thing." Roy pulled the squad to a stop where a man waved them over. There wasn't time for any further discussion about what was going on or why all these people wore such elaborate outfits. They had a possible heart attack. Both men scrambled from the squad, gathered the necessary equipment and followed the man into a tent where women sat with bead looms in their laps working on various crafts. A huddle of people stood around a man who was seated on a folding metal chair with his hand on his chest; he seemed to be gasping for breaths. Roy led the way over to the victim. Johnny moved a little slower and couldn't see past Roy to the victim. Roy bent over and spoke to the man who seemed to be refusing their help. Johnny heard the man's mumbled words. His ears perked up at the familiar language, and he smiled. The old man didn't want a paleface touching him; though Roy couldn't understand what the man was saying, he could tell by the look on his face and the way he pulled away from him, that he didn't want to be treated. He stepped to the side and sat the bio-phone on the ground next to the chair the man sat in. The movement allowed the man to see Johnny. He relaxed and pointed a bent finger at the dark haired paramedic. He announced in his Native tongue that he would allow Johnny to help him. Johnny lowered his eyes and bowed his head in agreement before approaching the man. Not being able to do much else, Roy set up the bio-phone, called in to gain connection with Rampart and waited for Johnny to get the vitals. While he waited he watched as a group of women crowded into the field and the drums began again. They had brightly colored shawls wrapped around their shoulders and draped across their outstretched arms. The women bounced on one foot and turned in a circle reminding him of a bird in flight, the fringe from the edges of the shawls moving in time with the beat. Some of the women tapped their other foot as they turned; some twirled an uplifted foot in the air. It was amazing to watch the rapid movement. He wondered how the dancers didn't fall from dizziness, because not only were they spinning they were moving in a circle around the dance area. The whirlwind of movement created a kaleidoscope of bright colors from the regalia the women wore. Johnny's voice pulled him back to the moment. He wrote down the vitals and repeated them to Rampart. Johnny waited for the instructions from the hospital. The man's breathing had slowed. He was no longer gasping for air. He had told Johnny that he had just finished participating in the grand entrance parade. Johnny suspected that the man was just winded and that after seeing the EKG that they could recommend he see his private physician. While he waited he watched the women dancing with longing in his eyes. He knew their movements had meaning…only he had been so young when he'd attended the powwows that he couldn't seem to remember what they were. In the crowd Johnny noticed a group of young girls preparing for their turn on the field. Their dance outfits were heavily beaded with colorful glass beads and from lengths of the fringed fabric hung jingle bells. The girls jingled as they walked. Johnny remembered the Jingle dance. It was a dance in which the dancers moved in time with the drums and became as instruments themselves. His memories also recalled that some of the women dancers would carry beautifully decorated fans that they would raise in honor of the beat of the drums. Most of the women and many of the men had long braids down their backs. Many of them also had head bands or beads in their hair. "Johnny?" Roy called to him breaking the thoughts that flashed in his memories. "Rampart said he can see his own doctor." Johnny nodded his understanding and turned back to the old man. He spoke to him softly in the language Roy didn't understand. The old man's deep brown eyes showed understanding and thanks. The paramedics gathered their equipment and turned to leave the tent. As they walked back to the squad, Roy asked Johnny who the man was and why he had such an elaborate headdress. "He's a chief." Johnny answered simply. While they walked back the way they had come, Roy noticed that the men's outfits were just as fancy as the women's. They wore many layers of feathers. 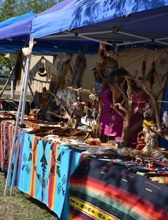 Some had feathered headdresses and some had something hanging from their backs with feathers. They all wore moccasins, some with plumes that nearly covered them. They were dressed in many layers which made Roy think they must be hot. He couldn't help the thought that drifted through his head at the westerns on TV where the men were shirtless and had paint on their faces and across their chests. The men here today looked nothing like on TV. Johnny stopped in his tracks making Roy turn to see why his partner had stopped. Johnny's head turned to the side and he lifted his nose into the air…sniffing. Roy had seen him do that many times at a fire or suspected gas leak. He knew to trust his partner's instincts, so he stopped to wait and see what Johnny smelled. Johnny could smell the scent of fry bread; he could almost taste the wojapi some of the older women on the reservation used to make to spread on the hot bread. It was an old traditional spread made from wild berries kind of like jam, but made with the freshest berries and naturally sweet. "Hey Roy." "What is it Junior?" Roy felt himself stiffen at the possibilities of what Johnny was about to say. "Let's get some fry bread." Johnny looked up and smiled. "You won't believe how good it is." Roy relaxed and continued to the squad to put the equipment away. "Okay, but then we have to go back in service." "Sure, sure Roy. Hey maybe we could get some for the guys at the station." Johnny caught up with his partner. On the way to the food vendors Roy noticed that some of the people had large flat decorated bags with tie down flaps similar to the medical packs they carried on out of the way rescues. He asked Johnny about them. Johnny explained, "Native Americans have made rawhide storage containers for many generations, and in all kinds of shapes and sizes for different uses. The specially prepared rawhide was referred to by the Europeans as "parfleche" (PAR-flesh), and was usually decorated with earth pigment paint in tribal specific designs. Kinda cool, don't ya think?" "Yeah, I wonder if Brackett would let you use one of those for your medical pack." Roy teased. Johnny looked like he might be thinking about the idea. They both laughed as they walked up to order their fry bread. On the way back to the station Johnny decided he would invest a little more time into learning more about the culture he left behind on the reservation so long ago.